Between the hours, the pay and the occasional scowling customer, working retail isn’t always the fun times it’s made out to be in film comedy. But at least there’s the employee discount, right? The folks at BuzzFeed compiled a rundown of the oft-complex employee discount policies for 22 different major retailers. There are the pretty straightforward discounts — 10% off for Trader Joe’s employees; ditto for Target; a full 20% discount for Bed Bath & Beyond workers; H&M ups the ante with 25% off. Then there’s the incredibly straightforward 0% discount for the men and women in orange at Home Depot. Meanwhile, their counterparts at Lowe’s are enjoying 10% discounts and savings at other retailers and businesses. 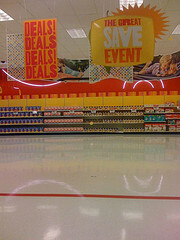 Some retailers place limits or minor conditions on the discounts. For instance, Walmart employees score 10% off, but not on food, cigarettes, or items that are already on sale. Best Buy workers only pay 10% over wholesale — well, sort of. That discount was recently capped to 50% off the retail price. That’s still pretty decent, depending on what the employee buys. RadioShack staffers get 30% off, but only on RadioShack brand products. Everything else is only 10% off. Over at JCPenney, employees save 20% on most things, unless they are shopping in the small appliances and furniture dept. then it’s 10%. However, JCP does occasionally have days where employees get 30% off everything. There are others with similar arrangements, like Macy’s & Bloomingdale’s, where workers from either store occasionally get to tack on an additional 20% discount to the 20% they already receive at the two stores. Whole Foods offers both a straight 20% discount and the option of increasing the savings to 30% via a program that awards employees extra percentage based on BMI, blood pressure, cholesterol, and whether or not they smoke. The Gap employee discount is apparently so complicated that BuzzFeed just sums it up by saying that employees can save anywhere between 30-50% at Gap, Banana Republic, and Old Navy, but it all depends on how much is purchased and whether you work at that store. On day one, employees are eligible for a 25% discount on the following products: iMac, Mac mini, Mac Pro, MacBook Air or MacBook Pro. The same discount is also available on one each of the various iPod models, an iPad, Airport base station, Apple display, and a “reasonable quantify” of Apple accessories. There is a 50% discount on most Apple software and 10% on third-party accessories, both in “reasonable quantities.” Friends and family of an Apple employee are also eligible, limited to three products at a 15% discount. In addition to this discount, Apple employees are eligible for either $250 off the price of an iPad, or $500 off the price of any Mac model, usable once every three years.